Scarecrow from Fresh Label on Vimeo. A furrowed field. The end of winter. The distant cawing of crows. A couple of farm workers turn up with a bundle of sticks and a pile of old clothes. They build a scarecrow. This is the story of a lonely scarecrow and a bunch of noisy crows. It’s about solitude and community in hard, hard times. The scarecrow hates the crows. Well that’s what you’d expect. But every time he chases them off they just keep coming back. The crows can take or leave the scarecrow. They’re too busy squabbling, eating and living their lives. All he wants is to be left alone. We follow their relationship over a year, from their beginnings as enemies, to their conclusion as grudging friends. From the creative team that brought you The Gardener, nominated for The Children’s Theatre Prize in Germany and The Chronos Prize in France. Mike is writer of the critically acclaimed York Theatre Royal production of E. Nesbit’s The Railway Children which has just completed a successful run at the former Eurostar terminal at Waterloo station London. The award-winning production will now transfer to Toronto’s Railway Heritage Museum, where it will open this summer. The production also returns to Waterloo Station in June for a summer run. The Railway Children has also scooped the Best Entertainment prize in the 35th Laurence Olivier Awards! Mike was also included in the Independent on Sunday's list of Top Ten Living UK Playwrights. 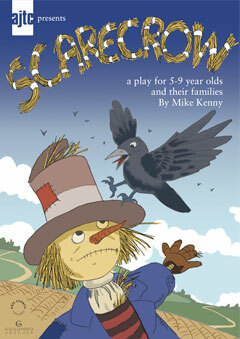 And Scarecrow was shortlisted for Best Play for Children & Young People at the The Writers' Guild of Great Britain 2010.